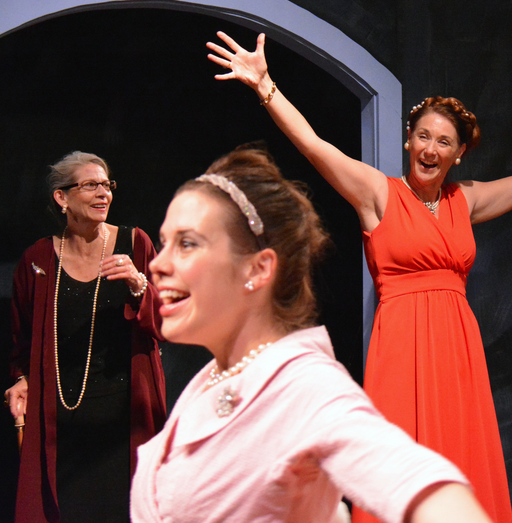 Michaela Greeley, Terry Bamberger and Katherine Otis in “Three Tall Women”. Photo Credit: Jay Yamada. Edward Albee’s “Three Tall Women” represents one of the greatest “comeback” stories in the history of American Theatre. In the early 1990s, Albee’s reputation was that of a has-been, with many believing his best work was behind him. With “Three Tall Women” he brilliantly answered any such detractors. The play was awarded the Pulitzer Prize for Drama in 1994, and went on to win numerous Best Play awards. It is produced often by companies all over the world. Admittedly, it is not a truly classic play, like Albee’s most famous masterpiece (need I identify “Who’s Afraid of Virginia Woolfe”?) but it is certainly a major work by a major playwright. CustomMade Playhouse and Director Katja Rivera have provided a straightforward rendition that does justice to this fine work, if not fully realizing its potential. In typical Albee fashion, the three women of the play are identified only as “A”, “B” and “C”. “A” is elderly (over 90), “B” is in her 50’s and “C” is in her 20’s. Together, they represent one life and — as suggested by their anonymity — every life, as we all move (barring the unexpected) from youth, to mid-life to death. The details of the characters are fluid. In the first act, they are quite separate: the old woman is senile and close to death, the middle-aged woman is her hired practical nurse, the young lady is a representative from her lawyer. In the second act, they gradually merge into a single person at differing life stages. Of course, that is absurd, but then this is the work of Edward Albee, for whom realism is a lie and absurdity the truth. The play is often quite funny (as it must be, because it speaks truth about life) but also unrelentingly sad, examining this essentially unpleasant woman under a microscope and offering little sympathy or hope. It is a grim view of life’s compromises and ultimate decay, punctuated by repetitions of the phrase “so it goes”. Audiences who saw CustomMade’s adaptation of Kurt Vonnegut’s novel “Slaughterhouse Five” will recognize the phrase, which Vonnegut famously used repeatedly in his novel about the absurdity of war. Albee’s appropriation of the phrase effectively suggests that he views life as an absurd and meaningless battle. This is grim stuff, but because the language is so striking, the characters so true-to-life, and the observation so acute, it is also deeply moving. The three actresses do not make very deep explorations into this complex character, but they do give clearly delineated performances that easily hold our attention. Michaela Greeley’s performance of encroaching senility is painfully accurate and moving. Terry Bamberger captures the winsomeness and regret of middle age, as well as its hard earned wisdom. As the youngster of the three, Katharine Otis is effective as she cries, “I will not ever be like you!” But of course she will, indeed, she already is. As the woman’s estranged son, who visits at her deathbed, Nathan Brown speaks volumes although he never says a word out loud. This production is a worthwhile rendering of a fine play. “Three Tall Women” by Edward Albee, produced by CustomMade Theatre Company. Director: Katja Rivera. Properties: Melissa Costa. Set: Stewart Lyle. Lights: Hamilton Guillén. Costumes: Scarlett Kellum. Sound: Liz Ryder. A: Michaela Greeley. B: Terry Bamberger. C: Katharine Otis. The Boy: Nathan Brown. Posted in Reviews.Tagged Charles Kruger, Custom Made Theatre Company, Edward Albee, Gough Street Playhouse, Hamilton Guillén, Katharine Otis, Katja Rivera, Liz Ryder, Melissa Costa, Michaela Greeley, Nathan Brown, San Francisco Theatre Reviews, scarlett kellum, Stewart Lyle, Terry Bamberger, theatrestorm, Three Tall Women.